I covered The Anatomy of Monsters back in May where I said that I hoped it turned out to be good as the central concept was pretty intriguing. This is a movie that despite it's obvious constraints still manages to be compelling viewing. I've been trying something different lately when reviewing films; to watch it with my VR headset on so that there are no outside distractions. This seems to really help with getting immersed in stuff. 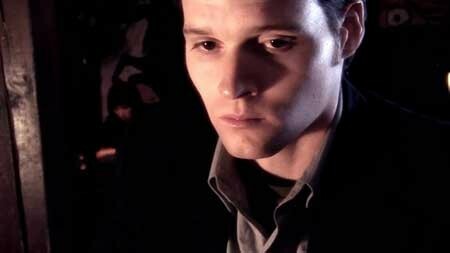 Andrew (Jesse Lee Keeter) is a serial killer and he has headed to a local club in search of his next victim. He befriends a lone woman named Sarah (Tabitha Bastien from Run, Hide, Die) and together they head to a motel where he intends to kill her. However just as it seems everything is going to plan Sarah turns the tables on him, revealing she knows exactly who he is, and that she too is a killer. What follows is a psychological mind game as she recounts her past while insidiously planting the seeds of doubt in her captors head. 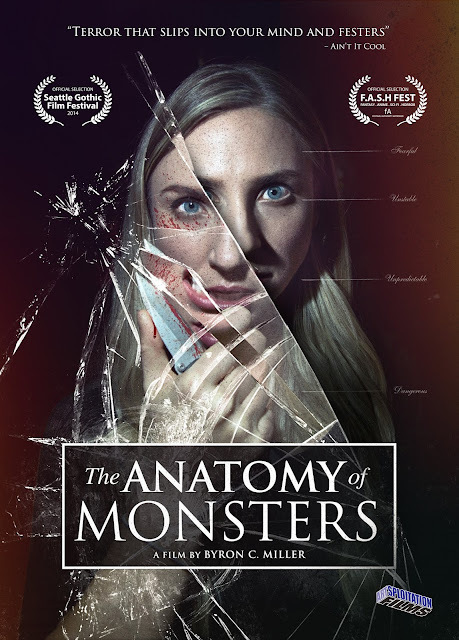 The Anatomy of Monsters (directed, edited and co-written by Byron C.Miller) throws a big twist quite early on into the film. The way it starts it seems this is all going to be about the character of Andrew, and that it is going to play out within the confines of the motel room. However the vast majority of this film takes place in the past, in the retelling of Sarah's story about the events that made her into what she is. I would go so far as to say the character of Andrew is only really in this for around ten to fifteen minutes of screen time in a ninety seven minute long film. This was a great way to play with expectations, more so as out of the two Lee Keeter is the less good actor. Bastien is a good actress, she plays her role with believability, my only problem was the times when she seemingly flipped between polar opposite emotions, though even this could be an aspect of her characters false projection she gives the world. The same cannot be said of the actress who plays her in her childhood sequences, especially in comparison to present day Sarah she seemed a bit wooden and flat. For a film about serial killers there is a lot of drama and not much actual horror. This is more about getting in the mind of a killer, finding out just what has made them the way they are and how they manage to cope in day to day life. While a lot of this film is the retelling of the past there are some interesting aspects to this such as the use of fake memories (one such one becomes pure slasher), events on screen occurring differently to the narration, and even memories within memories. This is helped along by a great script, it never gets too corny or stodgy though on occasion it does get close. I did get memories of Dexter watching this, elements such as Sarah keeping mementos of her victims for instance, while the central idea felt similar to that of Psycho IV: The Beginning (1990) that had Norman Bates phoning a Radio talk show to tell them about how he became the monster he was. The actual horror segments are fleeting and often glossed over, this fits with the little value Sarah puts on them, for her these are not huge events, just something she has to do to stay sane. This doesn't have the highest budget and this is most apparent during some of the murder scenes, these are often framed in a way that you can't see the killing blows (such as when she kicks a homeless man to death), and don't loose impact as a result, such as a chilling scene of her walking out a child's bedroom with blood on her face. The sound effects do suffer though, some real dodgy sounding stock gun shot noises, while at times you can hear background noise intruding into certain shots. In terms of the actual plot everything revolving around Sarah I enjoyed, it was interesting to see the moral dilemma she had of falling in love with a man who did not know anything at all about what she was really like. For me I hated the character of her boyfriend Nick (Conner Marx from Z Nation), I thought his character had the best acting of all the small cast but I didn't like him. The plot fell into holes at times (I get that maybe the Police wouldn't investigate the murder of a homeless man too much, but when she is breaking into people's houses and butchering them you would think they might pull their fingers out a bit), the central idea of her telling her story was just so well played out, it ends obviously but it was not trying to put a twist on that. The Anatomy of Monsters is held together by a fantastic dark synth style industrial lite score by Paul Morgan who also co-wrote, produced, as well as did the cinematography. This was supplemented by a few choice industrial tracks that help bring to life the world of Sarah. Now some of the acting might become nearly average at times, and it sometimes is let down by budget constraints, but overall I found this film to be very interesting, well edited, a great soundtrack and cohesive storytelling. The Anatomy of Monsters was released on November 15th on DVD and VOD/streaming services thanks to Artsploitation Films.